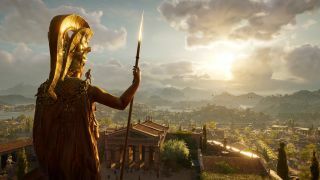 After getting our first in-depth glimpse of Assassin’s Creed Odyssey during Ubisoft’s E3 2018 press conference, we’ve been itching to get our hands on a control and our eyes all over that Ancient Greek setting. Now, we’ve had the chance to play the game for an hour and we’ve had a good rummage around the islands of Delos and Mykonos, and we’re ready to tell you some of the biggest and most important changes Odyssey will bring to the Assassin’s Creed series. The series may have returned to its annual release cycle, but Odyssey doesn’t feel like a simple re-hash of Origins set in a different time and place. Instead, it manages to takes the steps towards being an RPG that Origins first took even further. It could actually well be that Assassin’s Creed will slide into the RPG space that’s been left open by BioWare, which is focused on Anthem. But enough teasing, here are some of the biggest things you need to know about Assassin’s Creed Odyssey (apart from its October 5 release date). While Assassin’s Creed Odyssey is ostensibly a sequel to Assassin’s Creed Origins, it’s actually set around 400 years before it. The year in Odyssey is 431 BCE and you’ll find yourself in Ancient Greece during the time of the Peloponnesian War being fought between Athens and Sparta. This is the most ancient Assassin's Creed setting yet and it actually pre-dates the formation of the Brotherhood as well as the Creed. Previous Assassin’s Creed games have allowed you to play as a woman, but it’s always been part of a story that has you jumping between controlling a male and a female assassin. This time you choose one or the other - Alexios or Kassandra - and you play the entire game just as them. It doesn’t matter which of them you choose - you’ll be able to access the same abilities and skill trees. The choice is really just for looks and it won’t change the way you play. Your chosen protagonist is an ambitious mercenary in the game - not on either side of the war at first. We played as Kassandra in our demo and definitely would do so again. She's a likeable protagonist and, not only that, she genuinely looks like she could be a capable mercenary. The hidden blade has always felt like such a staple of the Assassin’s Creed games that this may surprise you. Just because the traditional hidden blade isn’t in the game, however, doesn’t mean you have absolutely nothing like it. Instead, you have the broken Spear of Leonidas, the historic Spartan King. Whether you choose to play Alexios or Kassandra, you are a descendant of Leonidas and the spear is gifted to you at the start of the game. Largely it works in a similar manner to the hidden blade - you can still stealth assassinate enemies, for example - and you can upgrade and improve it as the game goes along. But, being an artifact of the First Civilization this is a pretty powerful weapon to have in your arsenal from the beginning, and your connection to it is important. Oh, and it’s good for one hit stealth assassinations on enemies that are either on your level or sitting just one above it. Another of many big changes - for the first time Assassin’s Creed will have dialogue options. In the style of BioWare games, players will be able to engage in conversations with other characters and choose what they want to say from a range of pre-set options. The choices you make in conversations can change the course of the story as well as your relationship with the NPCs you’re conversing with. We weren’t one hundred percent sure on this before we played the game - voice acting and scripts haven’t always been the high point of Assassin’s Creed games - but Odyssey really pulls it off. We didn’t converse with every character in the game in our short time with it, of course, but the voice acting we did encounter was solid, faces were expressive and the script felt much sharper than usual. We even exhaled through our nose in appreciation at some humor at one point! Speaking of dialogue and big changes, there are now romance options in Assassin’s Creed. It doesn’t matter whether you play as Alexios or Kassandra, you can pursue a relationship with any of the eligible characters. The NPCs you’re free to romance don’t just exist as mannequins for your pursuit, though. Two of the romance options we encountered were rounded characters with their own aims, lives and complexities, and getting to know them is a process. Combat in Odyssey also goes down slightly more of an RPG path than Origins did. The skill tree introduced in the last game has returned, although this time the separation between assassin, warrior and hunter combat is a little more distinct and less overlapping. This means you can really focus on one particular playstyle and raise your skills in it to a really high level, or take a more balanced approach. What's really useful, though, is that when you unlock abilities on your skill tree you can map them to your controller buttons. We mapped a nice mix of abilities - a flaming sword, healing, the Leonidas kick and a shield grab. This meant that when we were being overwhelmed in battle we simply had to hold down a bumper and tap the relevant button to seize an enemies' shield from them and throw it at them to give us the chance to turn around and slash at someone else. Or, we could gain a little bit of health back. You do need to have some adrenaline in your shiny new bar to use these moves so they're not available to you constantly in battle, but building up your adrenaline levels is simply a matter of continuing to fight as normal. These changes to combat are a definite positive for Assassin's Creed Odyssey and we enjoyed fights a lot more than we did in Origins. It adds a diversity to your options and you feel like you've really got a chance when you're backed up against a wall. Remember how delightful yet detrimental to you Bayek's health was when the Egypt of Origins was populated with living, breathing creatures such as crocodiles, hippos and cats? Well, there are all new creatures in Odyssey and you can still hunt them. There are bears, sharks, dolphins and even whales to see. It was genuinely thrilling to be sailing our ship (actually we were directing the dozens of our men rowing it) and see dolphins leap up out of the bright blue waves alongside us. Sharks we'd be less keen to see, but we were told when a ship sinks in the water they'll draw in to eat the unfortunate soldiers who fall in. As if you needed any more of an incentive to win your sea battles. Given you’re not strictly an assassin this time around you’re not restricted by the Creed. That means you can fight and kill pretty much anyone you want. But don’t think there’s no consequences for this. Breaking the law will result in a bounty being placed on your head and other mercenaries will come for you. Just how many of them seek you out will depend entirely on how bad you've been. It's not permanent, though, and you can deal with the problem yourself or simply pay off the bounty on your head. There’s a big war going on and you can’t avoid it completely. Assassin’s Creed Odyssey will feature huge 300 soldier-strong battles and throw you into the thick of it. Some of these battles will be necessary as part of the game's narrative and sometimes taking part in them will be totally optional. They're a real test of your combat skills and the one we experienced was extremely fun, if slightly stressful. You'll find yourself surrounded by those with you and against you and even though you may set your sights on one enemy you'd really like to take down, you always have to be aware of others who have their heart on stabbing you in the back or leveling the back of your skull with their shield. We found using our abilities and being quick on our feet was absolutely essential to success when fighting these battles. Though Bayek and Aya from Origins are nowhere to be found here, the modern day story which follows Layla continues. Now, we don't know anything about where this storyline will be going (and, as usual, it seems like you can probably ignore it if you're not interested) but we're looking forward to finding out.